I was recently in Seattle, Washington for the 2018 International Retail Design Conference with my work colleagues. This was our first time visiting Seattle and attending this particular conference, and our week in the Evergreen State did not leave us disappointed. The three-day conference featured innovative speakers such as: Tim Brown, the founder of comfort shoe brand Allbirds; Rebekha Sigfrids, the VP of Store Design at Sephora; and a closing keynote from interior photographer Adrian Wilson, which brought the audience to its feet in applause. IRDC was a phenomenal experience and a fantastic networking tool for those in the retail design industry. For some quick insight into local context, Seattle is located on the Puget Sound in the Pacific Northwest, less than a three-hour drive from Vancouver, BC. The largest city in Washington, Seattle is a fast-growing city home to some of the world’s most successful tech companies: Microsoft, Amazon and Boeing, among many others. Referred to as the birthplace of grunge, many legendary musicians hail from Seattle, including Nirvana, the Foo Fighters, Jimi Hendrix and Pearl Jam, and the current music scene continues to flourish. What will resonate with most, though, is that Seattle is synonymous with the ever-present identity of Starbucks. Founded in 1971, the very first Starbucks café was opened across the street from the iconic Pike Place Market. A fun fact we learned during our stay: there is one Starbucks for every 4,000 people in Seattle! Everyone (no, literally everyone) drinks Starbucks in Seattle. Naturally, the Starbucks Reserve Roastery & Tasting Room was the first stop on our Seattle itinerary. Located in the trendy neighbourhood of Capitol Hill, this flagship location offers a brand-new coffee experience that engages the customer to experience the evolution of their cup of coffee: from the burlap sacks that the beans arrive in, to the roasting procedure right on-site, it is truly an immersive experience. Aside from their typical Starbucks menu, the Roastery features: Princi, an Italian bakery offering a variety of pastries, sandwiches, and salads; a full-service bar; and a lifestyle shop with Starbucks merchandise and various collaborations. Designed in-house, the interior of the space was warm and inviting, and embodied the style of west coast modern. I couldn’t help but think how well this space could do in Toronto with the proper adaptation. That afternoon, we went on a guided tasting-tour through the historic Pike Place Market. 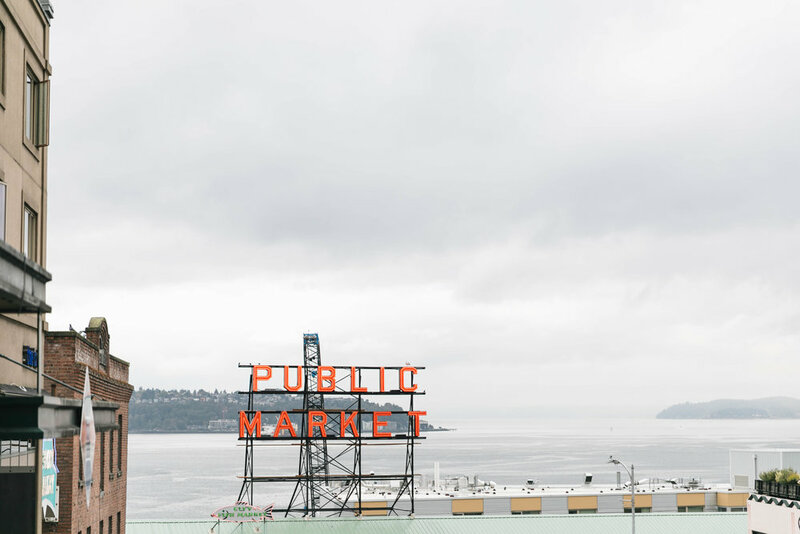 Founded in 1907, the Pike Place Market is one of the oldest farmers’ markets in the USA and is currently home to over 240 local businesses, including fresh produce stands from 85 different farmers. It is best recognized as the home of the fish market where the catch of the day is tossed among fishmongers, surely enticing customers and tourists alike. Through our local guide, we tried samples from Saffron Spice (the best veggie samosa I’ve ever had), Simply the Best (dried cantaloupe, glad corn, and honeycrisp apple chips), Ellenos Greek Yogurt (lemon curd yogurt), Los Agaves (tacos al pastor), local produce stands (fresh Asian pear), Pike Place Chowder (the best New England clam chowder in Seattle), Honest Biscuits (biscuits with Beecher’s cheese, a Seattle landmark), and the Tom Douglas Rub with Love Shack for the city’s famous salmon burgers. One could easily spend an entire day wandering, and eating, their way through this worldly market. A week gave us a great deal of time to learn the city. 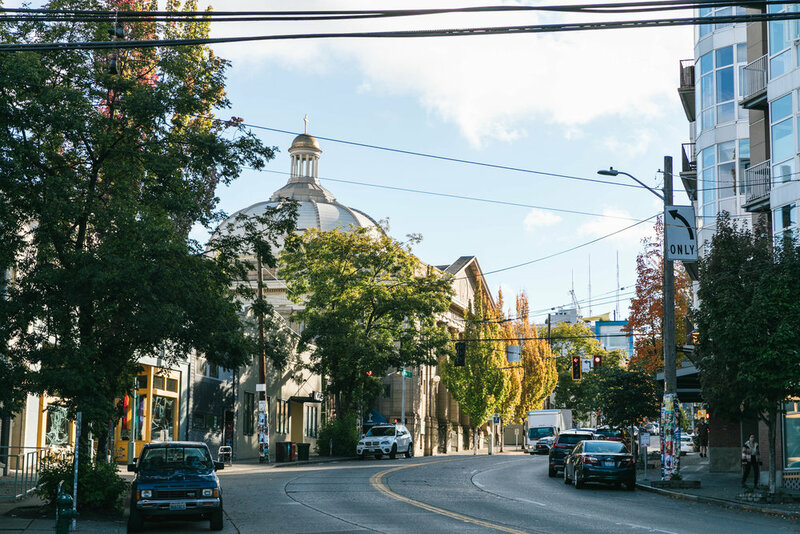 We explored Pioneer Square, a neighbourhood in downtown Seattle known for its historic 1800s Romanesque Revival architecture, art galleries, trendy bars, and cafes. Here, we stumbled upon the Seattle Glassblowing Studio, where we watched artists create extraordinary works of glass art. In Capitol Hill, we went to the Melrose Market, an upscale re-imagining of the Pike Place Market, which featured food artisans, cafes, and restaurants. For work-related research, we drove across the floating bridge to Bellevue, Washington to visit two distinctly different shopping centres: the upscale Shops at Bravern and the more accessible Bellevue Square. Another highlight was our visit to Day 1: an office building segment of the Amazon HQ complex in downtown Seattle. Considered one of the city’s most expensive construction projects, this block also features the brand-new Amazon Spheres and Amazon Go. The Amazon Spheres are a series of spherical conservatories housing living walls of over 40,000 plants from around the world. This biophilic paradise allows Amazon employees to work or relax within a comforting biodome, and although it is specifically for Amazon employees only, members of the public can visit the space through sanctioned weekly tours. Around the corner from the Spheres is the very first Amazon Go, an innovative retail concept that is completely cashless: customers scan their phone to enter, pick up a product, and scan to leave, no cashier necessary. On our last day in Seattle, we rounded out our sightseeing with a visit to the Space Needle, Chihuly Garden and Glass, and MoPop, the Museum of Pop Culture. For Torontonians, the Space Needle isn’t anything special – our CN Tower is way more impressive! However, one should never pass up an opportunity to preview a cityscape from a unique vantage-point, and the Space Needle definitely provided a new sense of scale for me. Chihuly Garden and Glass was spectacular, and features one of Chihuly’s largest suspended sculptures. Seattle’s MoPop Museum is dedicated to contemporary pop culture, and is by far one of the coolest museums I’ve ever been to. While we were there, they were showcasing an interactive exhibit of independent video games! As our conference came to an end, we all concluded this was one of the best work trips we’ve ever been on. Seattle is a fantastic city and exceeded all our expectations – its relevance to the retail industry made it a key setting for this year’s IRDC. As my colleagues headed back to Toronto, I continued my West Coast adventure by heading south – to San Francisco! More to come soon!